I have always wanted a St. Bernard so when my co-worker's St.Bernard had a litter I was so excited to be able to have one. At the time we had 3 other dogs and Mozart(St.Bernard) was raised my the the other dogs in the house but this summer was a hard one for this family. One dog had to be put down due to kidney failure and cancer, one died from his stomach turning and another one our smallest went on vacation with us and we think she found decon and we lost her. I have been falling apart, and Mozart is really starting to play rough with us. We have thought that he needs a new play mate but anytime we get him close to another dog he gets very aggressive. Mozart is a 8 month fixed male and I would like him to be able to get along with other dogs. Last night my husband let him out of the back yard he went to our next door neighbors house to bark at their dogs through the fence, our neighbor went to pet Mozart and he bit her. The Online Dog Trainer here. Our Saint Bernard (Sophie 3-4 years old) has never tried to bite anyone, but when my boyfriend and his 4 year old son moved in she had become aggressive. When ever my daughter and my stepson run around and chase each other she tries to bite him. She knows better, and we usually smack her when she does things she isn't supposed to, like when she jumps up on the table and snatches food. We don't know what is wrong with her, she gets a lot food but she only tries to bite my stepson but no one else? We are seriously thinking about putting her down unless we get help. on Friday, May 6, 2017 as my friends were walking into their building, their chihuahua met face to face with an exiting St Bernard. It happened so fast, the St Betnard bit into that tiny dog, he was rushed to the animal hospital and there wasn't any hope. This is a nightmare . I thought St Betnards were gentle. It's a nightmare. 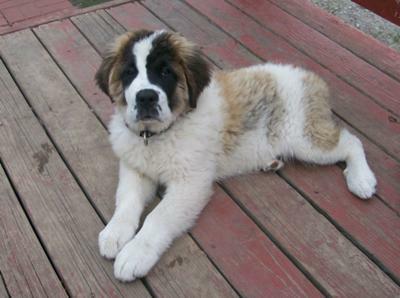 Our St Bernard puppy is 3/4 months old. We have two young spaniels also who are past puppyhood but smaller than he is. He is growing so rapidly! He has begun pushing these female spaniels around. Muscling up to them, barking at them etc. his new favorite thing to do is to drag them - helpless - around the yard by their collars to their obvious distress. We have recently rescued a saint. She is 2 years old. We have 3 cavaliers and 3 chihuahua all female ranging from 2 to 4 years. All was well until the saint had a puppy. We were not aware she was pregnant. Since the birth she has bitten out daughter and grand daughter who is 3 months old and stalks the other dogs attempting to bite them. The saint has learnt how to open the door to the room we allocated so isolation is not really working. She is constantly on edge. What can we do? When are St Bernard became about 14 months he became a bully. At first we thought how cute he is protecting us. Now Leo is in aggressive training because he has bite a little girl, a woman and the k-9 trainer. I am so afraid to have Leo around my grandchildren. They are 5 and under. Will it get better, or will life with Leo always be this way? I have a year and a half year old st bernard. I adopted him a year ago and was told how good he was with other dogs and that he was submissive to there other male in the house. When he came to my house he immediately had problems with the other male in the house and became quite aggressive. He had no other problems with other dogs we came across walking or hiking. As he has spent more time with me the area's in which he is territorial about are increasing. He has had altercations with one other dog on a trail we frequently hike and don't usually see other dogs on. In total he has now fought with 5 dogs. Although none have been seriously hurt. I am no longer feeling like I can take him out and be in control of him and he is quite difficult to hold back when he gets his mind on something. I am getting to the point that I might have to rehome him which breaks my heart but I dont know what else to do. Territorial aggression is completely different from regular aggression. He may be perfectly fine, in all other contexts. - Get him started on an obedience training regimen. - Learn to identify his aggression cues. Correct him, before he bites, if it's inappropriate. However, territorial aggression is something that just comes with owning this type of breed, so it would be best to fence the yard in such a way that nobody can stick there hands in. In other words: It's not really abnormal behavior.